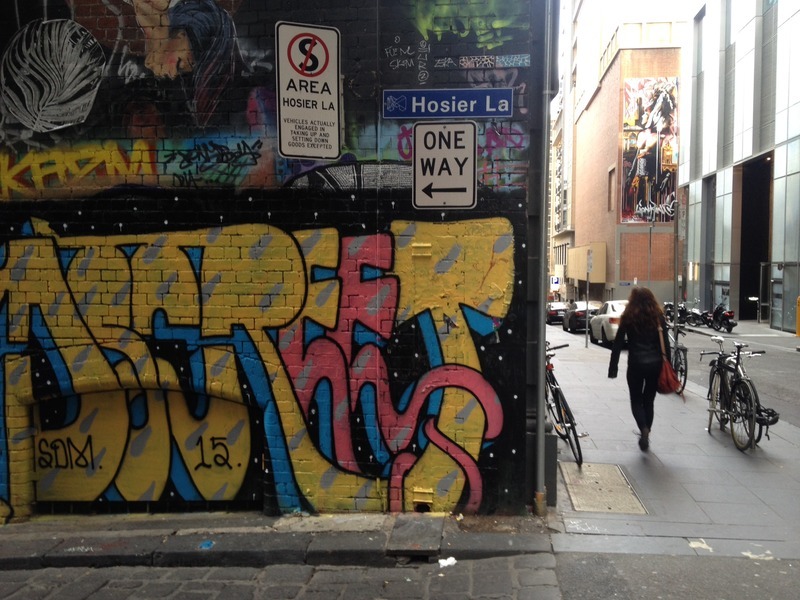 Find the Hosier Lane and One Way Sign (on the right side if facing down Hoiser Lane). With your eyes closed, place your hands on the wall a foot below the One Way sign, then feel your way to the right till you come across something protruding from the wall. Trickle your fingers along its edges. Feel the grooves of the creature, what is it made up of? Sense the cold clay and all its cracks and details, moulded into various objects. Outline the object with your hands concentrating on what each individual section is. Pick apart the piece with your mind, what could it be? Observe the piece again; now with your eyes and hands. Explore the familiar cracks and crevices that now come together with your sight to form this peculiar little creature. Is it at all what you expected? The beauty of street art comes with the sense of added connection, you have the ability to get involved with the art, communicate with it, and use your senses to experience it. The pieces facilitate your interactions as you feel the groves of the work; the intrinsically sculpted wings or the flattened bottle-cap that together form this strange little guardian of the lane. “Fly on the Wall,” Street Art deTours, accessed April 20, 2019, http://streetartdetours.com/document/1005.